On November 24th we hosted our first ever Swept Away. It was a day so filled with love that it left me in complete awe. I arrived early Saturday morning to find the Blooms and Flora team hard at work on setting up the amazing ceremony installation. I have never seen anything so darn beautiful in my entire life! Seriously, y’all… look at this! Throughout the day we transformed The Modern Bride from a wedding dress shop into an absolutely gorgeous wedding venue. With ceremonies staggered throughout the day, our first guests started to arrive around 2:00pm. By 7:00pm four amazing couples had tied the knot and started their new lives as a married couple – it was truly a dream to witness! I think my favourite part was seeing how different each couple was! While the backdrop for the ceremony remained the same, each couple personalized their vows and told their story in a unique way. Each dress they choose and each hair style was completely different – so it was fun to see the differences shine through! What is Swept Away? How Does It Work? Swept Away is an elopement event reimagined for the modern couple. We wanted it to be romantic and elegant while being a stress free and “out of the box” experience. Simply choose your ceremony time, and the rest is taken care of by our amazing team of vendors! From hair and makeup all the way through to cocktails and appetizers, your wedding details are all carefully and meticulously planned. About a month before the big event, you are invited to an Open House to meet all of the vendors! You get a chance to chat with each vendor one-on-one about your preferences to tailor pieces of the day to fit your needs. We know relationships are not “one size fits all” so your ceremony shouldn’t be either! How Did You Come Up With Swept Away? It’s kind of a funny story! Jessica Imrie Photography and I were actually planning a photoshoot with a few other vendors. We were sitting in a cafe one blustery January morning talking about how it’s such a shame to put together these beautiful shoots just to tear them down. 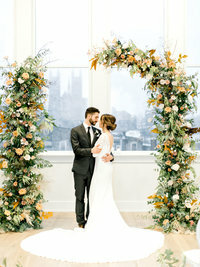 Our dream was to find a couple who would be interested in “eloping” during one of the shoots so the decor and florals would be put to good use! We had an “ah ha” moment – and realized it was something that we could totally (maybe?!) pull off. At the time it seemed like a huge impossible pipe dream – but as fate would have it, I happened to be meeting with The Modern Bride and Coccola Beauty just a few days later. I excitedly spilled my wildest dreams to them and they were both like “Uhhh, yeah, let’s do it!”. 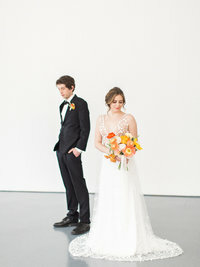 The Modern Bride graciously offered their AMAZING space (and their AMAZING dresses) and Swept Away was born! You can get Swept Away for just $4000. The flat fee includes hair and makeup for one, a dress for the ceremony, your bouquet and boutonniere and ceremony florals. As well as photography, champagne for toasts, a photobooth, cocktails and appetizers for your hour reception and a sweets table! If you would like to add on and personalize your day even more, we have a list of A La Carte options you can choose from as well! Want to send out beautifully hand designed invitations? We got you! Want a custom wedding cake? We can take care of that too! There really aren’t words to say to thank this amazing team of humans for helping pull this day off! If you are looking for an epic team of vendors to help pull *your* special day together – look no further!